Even if you didn't read the article but just looked at the pictures, you've got to remember this one. An Airbus A320 on push back from the gate encounters the wing of a Boeing 777. Go ahead and click through to the full report which you can find here. Or, if you wish, here's the thumbnail version and my own take on it. Ground-based accidents and incidents are phenomenally expensive for industry, anywhere from $4 to $10 billion dollars a year in repairs and equipment down time. 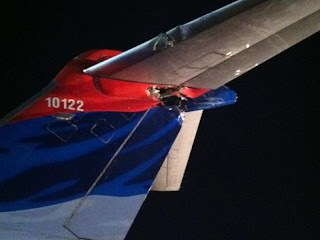 Or as Bob Matthews of the FAA put it, "Damage to the wing of an A380, a bazillion people inconvenienced; you’re sucking up money like crazy over this one." 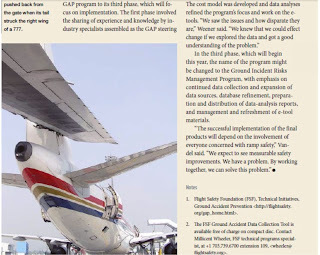 On the human side, according to statistics from several years ago compiled by the International Air Transport Association, the Flight Safety Foundation estimated there were twenty-seven thousand ramp accidents a year in which 240,000 people were injured. This runs the gamut from ground personnel to passengers, gate agents and flight crew. I made a small list describing some of the fatal accidents at U.S. airports over the past few years, which you can see here. The numbers seem high even to the folks at IATA and they should know. The organization has had its hand on the pulse of ground operations for years. Beginning last month, it began the first industry wide effort to collect data on ground based events. Most accidents are like the one at Bradley involving land-based vehicles like fuel and catering trucks hitting airplanes or engines. 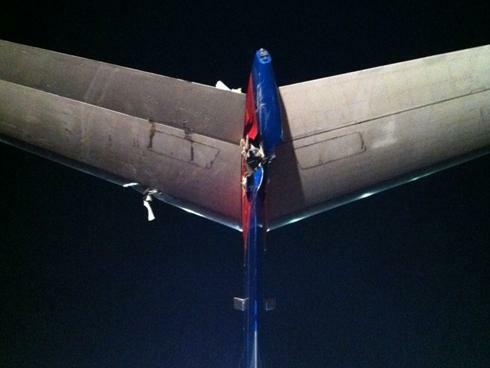 But some are plane-on-plane just like Monday's JFK event. When I ask my contacts at IATA and the FAA, "What is the common factor in these accidents?" I am told that a lack of standardized procedures plays a large role. Safety isn't a new science. It is well known what contributes to accidents - any kind of accident - working too quickly, inconsistent practices, lack of communication. So its striking that even today, there is no standard practices manual for ground operations. Each airport, sometimes each airline, determines its own way of working. Throw in ever busier airports and a growing fleet of large - no let's call 'em humongous - airplanes reducing clearance margins and well, there's your recipe for chaos. But wait, there's news. Next year, IATA will distribute to its members - roughly 93% of all the world's airlines - a ground operations manual, the "first globally harmonized set of ground handling procedures which will improve ramp safety and reduce training requirements," said Anthony Concil, director of communications for IATA. The idea here is to codify the best practices and eliminate a lot of the make-it-up-as-we-go along practices that result in bent tin, broken bones and worse. Had it been a picture book, it couldn't have come at a better time. The people on the A380 and the RJ are simply some of the luckiest folks alive. 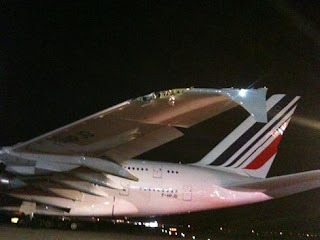 If that tear in the A380's wing had been just a bit more inboard and sliced open a fuel tank spilling JetA onto the hot motors of the RJ, this would have become a disaster of unbelievable proportion. Guess it just wasn't their time. 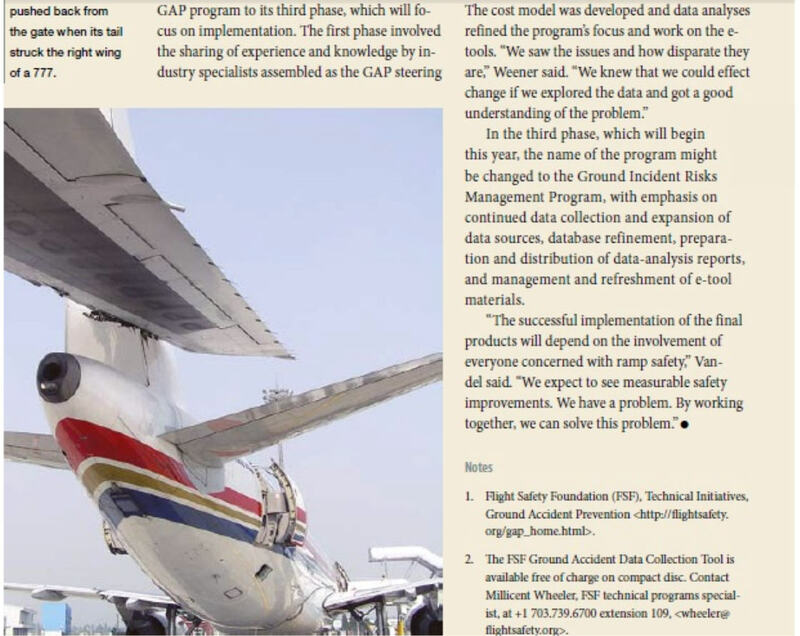 A good idea for IATA to generate a standard ground ops handbook, but how are they going to force the airports to adopt it. IATA isn't about to tell the Port of NY & NJ Authority that their members are going to stop flying into JFK & EWR unless their standards are adopted. IATA may be able to pressure for adoption, but can't enforce anything. The core issue is that airports have succumbed to pressure to accept aircraft that are too large for existing airport real estate. At LAX, QANTAS's AB-380s haven't been a problem because they depart late at night, their ground routes are protected, and LAX has much more space than JFK.